I just returned from the Rocado Uneuixi river and I can say, “WOW” what a trip. If anyone is seeking a 20lb+ Peacock, This is the river with the greatest opportunity. I personally landed 5 over 20lbs and had opportunities for more. River Plate and our host Alejandro were fantastic. My thanks to Dawn and J.W. at R&G for all their advice and counsel. Beautiful river with clear dark water. 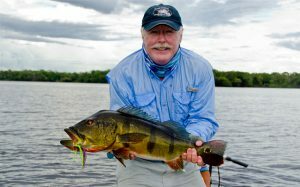 The finest “big Fish” river in the Amazon + the guides are terrific. Thanks for a Wonderful trip. The entire trip was awesome. I hesitate to mark this off my bucket list because feel the true need to return. The entire staff provided extraordinary and personal service. You could tell that they enjoy what they are doing and strive to pass along the greatest experience. Amos met us enthusiastically at the airport when we landed and personally took us to the mall on our return leg of the trip to get a cheeseburger. Alejandro was the most amazing host and the stories he could tell kept us entertained every evening. The guides were top notch with incredible boat handling skills. 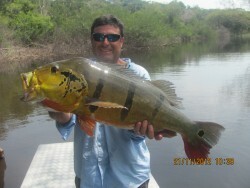 A special thanks to our guide Manuel for putting us on the big fish. I hooked four consecutive fish over 10 lbs by simply following his directions on one magical day. As you can tell from the attached pictures, catching fish is only a part of the amazing experience I had. ” The trip was AWESOME!!!! Everyone had a great time. I think our guide total was 600 fish for the week with 75 over 8 lbs.. Biggest was a bit over 17 lbs (in the photo w/ me and a lime green shirt)…… Everyone had a fish in the double digits; Steve actually had a 12,14 and 15 pounder the first full day!!! I think the full moon hurt us a little bit; the woodchopper bite was very slow every morning but would pick up mid day after lunch. Jace and I along with the boys through pretty much nothing but the woodchoppers……. Steve and Gary never through a chopper!!!! HAHA!!! We received the following testimonial from Rolando Chavarria Barrantes who came from Costa Rica through Alejandro Linares (Agent). I am writing these lines from Costa Rica to express our thanks to you and all River Plate´s Anglers staff for the excellent job done regarding our trip. Since our arrival to Manaus airport until the day of our return all the staff performed wonderfully. Our host, during our stay at the floating cabins stationed at the Xeriuni, Adam Kryder, was always alert to our every need at camp and when fishing. The kitchen staff, cleaning, maintenance and guides, all did their best and made us feel excellent during the whole week. 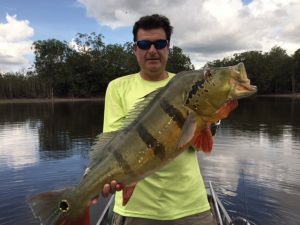 Fishing was spectacular every single day, lots of peacock bass above the 8 lbs mark made us enjoy each fight with one of the biggest freshwater preys and possibly the best of all the sport fishing world. How aggressive they were, and how they attacked the surface poppers !!! Quite an enjoyable show!!! 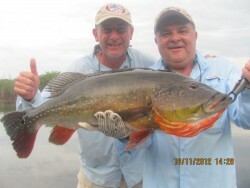 All our group from Costa Rica was very pleased with the experience and the the very special sport fishing moments lived, also comradeship and a friendly environment with our fellow sport fishermen at camp helped enormously. Find enclosed some photos of the wonderful moments that we lived. Finally, thank you again for such a marvelous trip. I don’t know what to tell you. The stars really lined up on this trip. I know that you and river plate had alot to do with it, but this was one of the best trips I have taken part in. The people in our group all got along well even thought there was a mix of gear and fly guys. It was a treat for me to meet Joan and Steve, and hear about all there travels past and future. They are really nice people., and we had a good time with them. Everything seemed to run very smooth going in. The fellow in Manaus met us and sent us off without any problems. He was alright, but not as cordial as Amos whom we met at the hotel. When we landed in the jungle, the float plane was there and waiting to exchange passengers. We got to camp by 9:17am, and got some good fishing time in. Our camp host, whom we called Bison was exceptional. He was more attentive than anyone I have ever seen. He would see us off in the morming, greet us coming back, sit with us after fishing, and at every dinner he literally stood over us with the server and wouldn’t let us get up for anything. He would constantly ask if everything OK? , and attend immediately to your request. The food was good, and plentiful, with many entrees at breatkfasts and dinners to choose from. The weather was overcast, so the heat wasn’t bad, The guides were all good, and as you know we all caught fish. 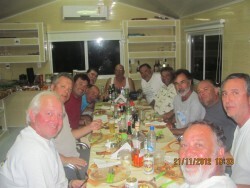 The cabins were clean and kept that way each day when we returned from fishing viagra tablets india. They also did an exceptional job of cleaning our clothes. I think you will get a 100% rating of 10 on a scale of 1-10 from all 8 of us. The fly guys caught more fish as you predicted and the gear guys caught many many big fish. I got a copy of Bison’s end of week tallies and will share some of it with you. One thing that would be helpful would be language card with fishing phrases like how many fish, how heavy, etc. to better communicate with the guides. Thank you Keith and River Platt for putting together a most memorable trip. It was a pleasure experencing the skill and professionalism of all those involved. I wish to share with you the enclosed testimonial (with a free translation), that although in Spanish, clearly shows the excellent results obtained by this group fishing the lower Jufaris, note that every single angler in this group brough back home a photo with a trophy. This is most important since it demonstrates with hard facts that our preservation policy, right at the core of our business, has been successful. As you might recall this area has been, protected and recovering during the last 3 years. Trophies landed here have leap-frogged from one season to the next, being the last season a clear example of the potential of seriously engaging in a strict preservation programme. Fishing reports throughout the season simply show that this is not an exception, it is the rule. We strongly believe that we are in the right track and we seriously commit our best efforts to enforce best practices of our proven preservation policies in all our present and future operating fisheries. 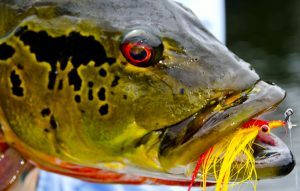 This will guarantee that we are able to continue offering the very best fishing environment and chances to our visiting anglers in the Amazon Basin. 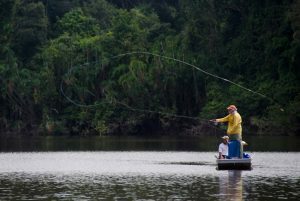 “Anibal (agent), in the name of all the members of the group of Ticos (Costa Ricans) and Colombians we wished to thank you very much for your special collaboration in enabling, for the third time in a row, an excellent fishing trip to the river Jufaris with your represented outfitter River Plate Anglers. 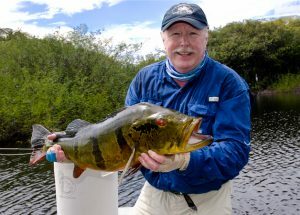 We landed near to 1,000 peacock bass, more than 50 trairas and we released more than 35 peacock bass in the range of 7 – 21,5 lbs; among them 4 trophies of 21,5lbs, 3 weighing 20lbs, 35 between 7 and 19 lbs including: Tucunares Açú-Paca, Mariposa y Cinchado o Speckled with great sizes, a Paca of 17lbs, butterfly of 11 lbs which is 1lb below the world record. Service since our arrival to Manaus and at camp was excellent, outstanding kindness and service vocation of Harold (camp host), fishing guides and camp staff as well as the food offered. 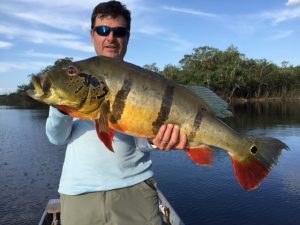 I would like to recommend specially our boat and fishing guide “John” with whom we fished for the second time and certainly is a great guide, very attentive and collaborative and really knows peacock bass fishing as no other guide with whom I have fished. John guarantees a good fishing day! 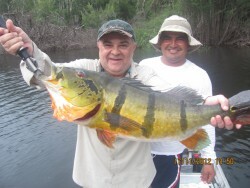 We are totally pleased and thinking in our next trip with River Plate Anglers. I am attaching pictures of this trip. Again, thank you very much Anibal, and please thank and say hello to Mr. Luis Brown. We expect to be able to return to fish soon enough. fish. a total of 88 Peacocks for the day. With fishing results like I had it is easy to rate the experience as Excellent. However special recognition is due Daniel our camp host. His attention to the details of making our trip a success was truly incredible. I feel he is a real asset to River Plate. What a true gentleman. The fishing report tells the tale of my guide Tunino? He grew up on the river and knows where the big Peacocks live. Although he spoke no English and I spoke no Portugese neither of us were at a loss for words as we admired all the fish. He was one of the best guides I have ever had and would request him every time. Thanks for making this a most memorable trip, I hope to do it again soon. The outing was just great. I could send several pages on what we liked. Our entire group had a great time. The fish were really hiring the lures. Nothing compares to a strike/hit like a peacock bass. We caught and released over 400. I do not remember using jigs in the past I wish I had taken a few more. Woodchoppers are just as tiring as I remember. Amos with River Plate picked us up and took us back. Timely courteous and very helpful. Great crew at the camp. Alejandro and his team did a great job. They went the extra mile helping land the fish and salvaging our lures from roots and tree tops. By the end of the trip we were sharing family pictures and activities the families are involved in. We also earned how to make bows arrows and how to use them. I think all of us gained weight the food was great. Great camp crew. Everyone hopes to do this again some day. 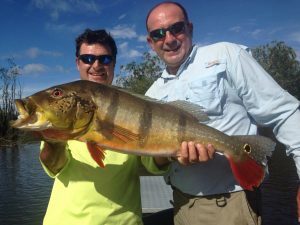 My group of three returned to Brazil in January 2016 for another week of peacock bass fishing with Rod & Gun Resources. We were scheduled to fish northwest of Manaus, but the water levels were very low. Fortunately for us, J.W. Smith changed our destination about a week before we left and sent us to the upper Matupiri River. We had an amazing week of fishing with most fish caught on big top-water High Rollers. In six days of fishing, the three of us caught 596 peacock bass with 65 over eight pounds. Our biggest fish were four at 14 pounds, two at 16 pounds, and one at 18 pounds. I spent my 21st birthday last January peacock bass fishing in the Amazon with my grandpa, Charlie Reichenau. I couldn’t have wished for more. I caught my first 20 pounder the day before my birthday and topped it off with a 21 pounder on my 21st birthday. Trip of my dreams! Thank you for great fishing! Hope to come back to you soon. Best regards. Managing Director. Royal Safari S. A.